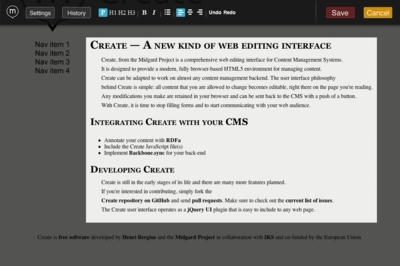 Create is a new kind of web editing interface built on top of that. As the IKS project has entered its fourth year, both of these projects have gained maturity and contributions from many IKS partners and early adopters. While Create can be used for building any sort of custom user experiences (as seen in the CMS integration examples below), it also ships with a default user interface. Nemein's Riku Virta has designed a new UI concept that is currently being discussed on the CreateJS mailing list. See the full UI concept in the slideshow on Google Plus. We hope that we will be able to land this new UI still within the March-April timeframe. VIE is now nearing the 2.0 release, with the first RC expected for the end of this month. After that we'll have a hackathon in Saarbrucken, Germany where the plan is to focus on things that we've targeted for a 2.1. The final API for this is still being discussed on the VIE mailing list. Thanks to contributions from Alkacon, Create's widget selection mechanism is now much more configurable. This allows CMS developers to provide different editing tools for different types of information. The currently bundled editing interfaces provide integration with Hallo, and also with the 0.20 version of Aloha Editor (though you will need to install Aloha separately to use it due to licensing restrictions). CMS developers will also benefit from Blogsiple, the new integration testbed for Create and VIE. Blogsiple aims to be a very simple blog system built on top of Node.js that shows all the necessary integration points for supporting the whole range of VIE and Create features. Polymedia's video annotation example is also interesting demonstration of VIE in a completely different kind of CMS environment, as is WordLift by InSideOut10. The IKS Early Adopter program is still open if you're interested in getting support for using these tools in your CMS. There will also be an IKS event in Salzburg on June 12-13 where we will be able to show more.